The great south west island hopper. 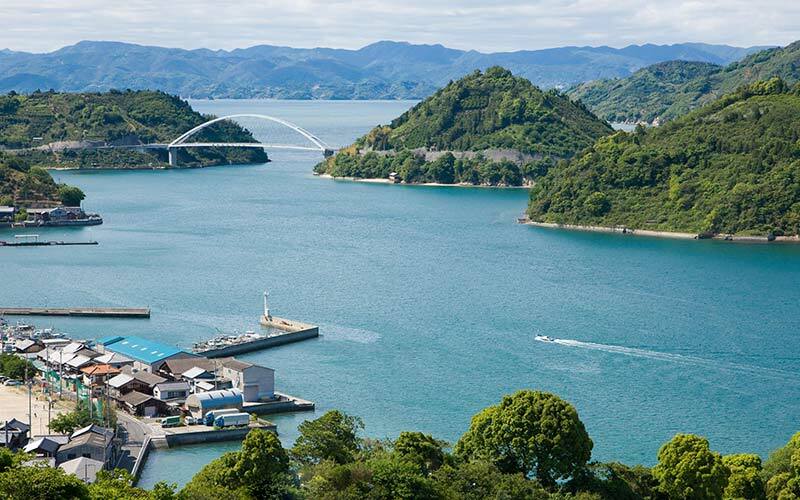 Shikoku, Japan’s south western island separated by the Seto Inland Sea was only accessible by ferry until a few decades ago. Steeped in religious history the island has 88 Shinto temples that pilgrims walk 1,200 km to pray. Rich in natural beauty of snow covered peaks, ancient forest, river valleys and pristine oceans. Visit a few of the hundreds of islands along the way, eat fresh seafood and slow down to island life. 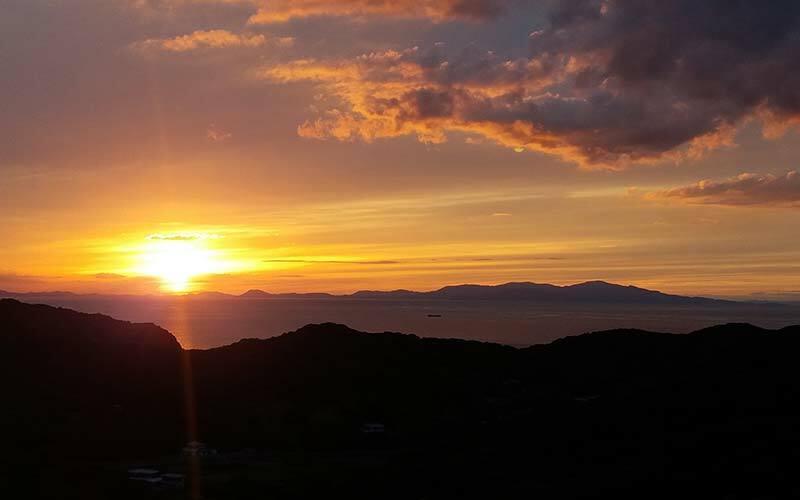 Make your own pilgrimage on Shikoku and the Seto Inland Sea. 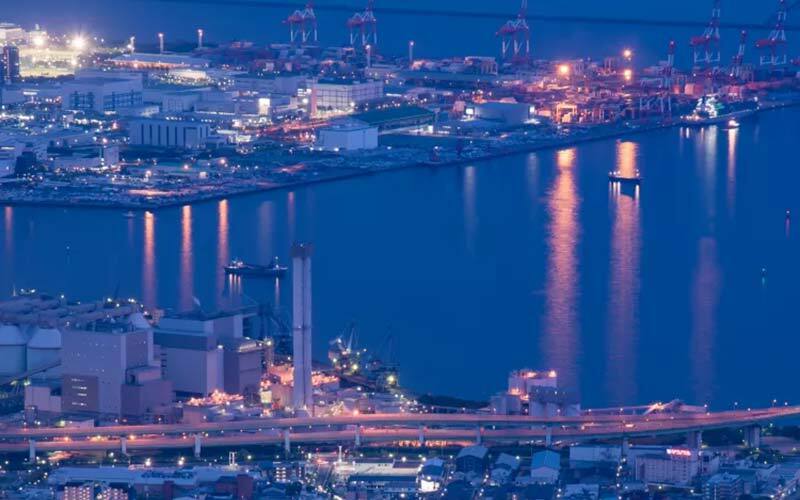 Starting from our Osaka office or Kansai International Airport, follow the road for 1.5 hours around Osaka Bay towards Kobe, famous for its beer fed marbled beef. Then on to Akashi city and the Akashi-Kaikyo Bridge. This engineering marvel is has the longest central span in the word at almost 2 kilometres. 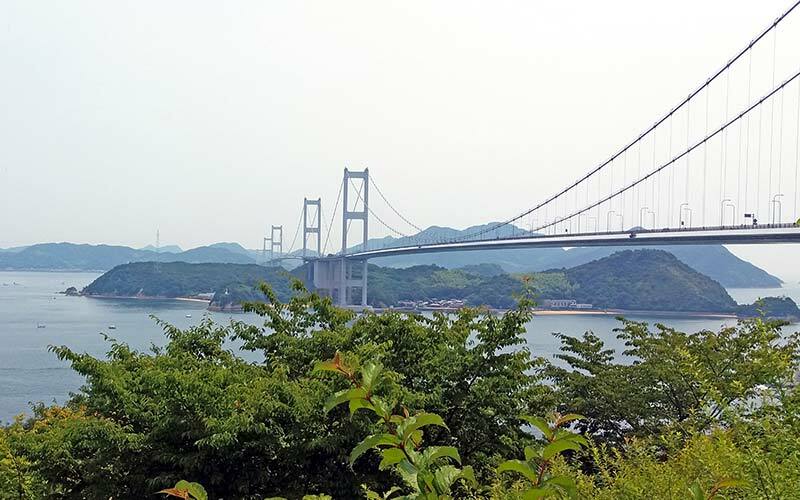 There is a park under the bridge with viewing area across the Akashi Strait of the Seto Inland Sea and a great place for a stroll or fishing. Then it is just a short drive across to Awajima Island and take the first highway exit to Awaji Rest Area were you can get great views across the sea towards Kobe city and Osaka in the distance. From the southern end of Awajima Island the highway crosses over to Shikoku on the Onaruto Bridge and Naruto Strait. 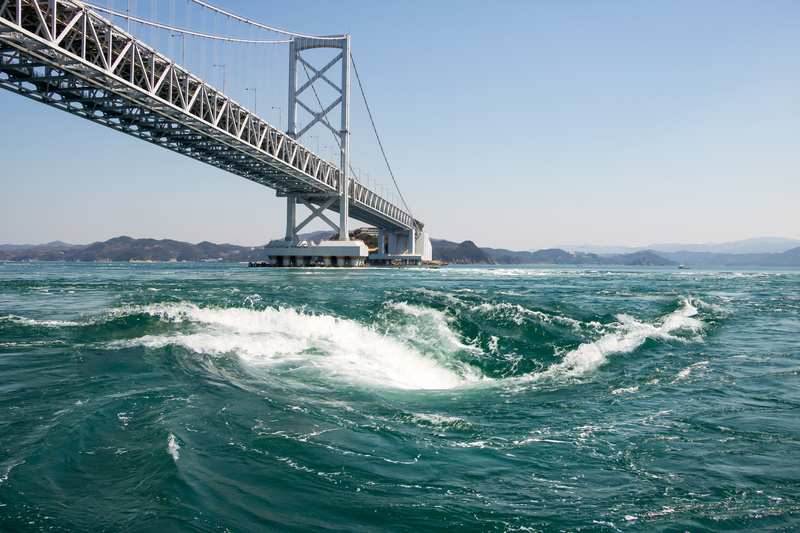 The anime series that goes by the same name of this amazing place is also famous because of the huge whirlpools that form in the ocean due to tidal influence. Some of these can 20 meters across and make unusual sounds as they draw water and air down. 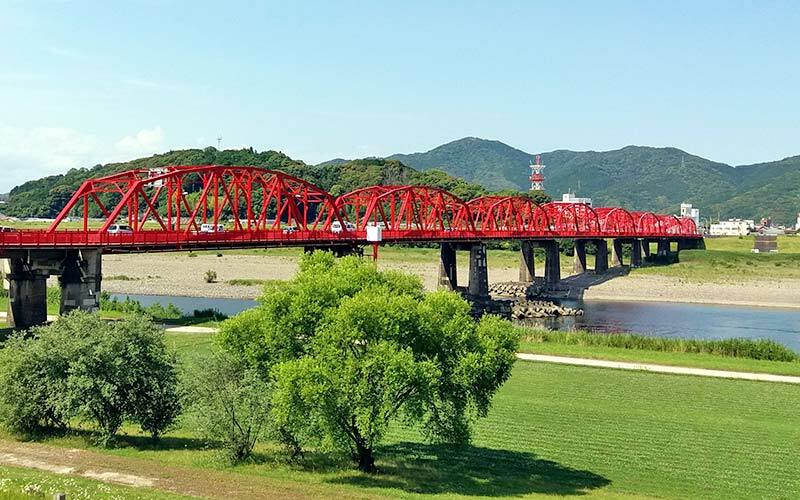 You can view by sightseeing boat or by walking along under the Onaruto Bridge starting at Senjojiki observatory. Find out more about Naruto . 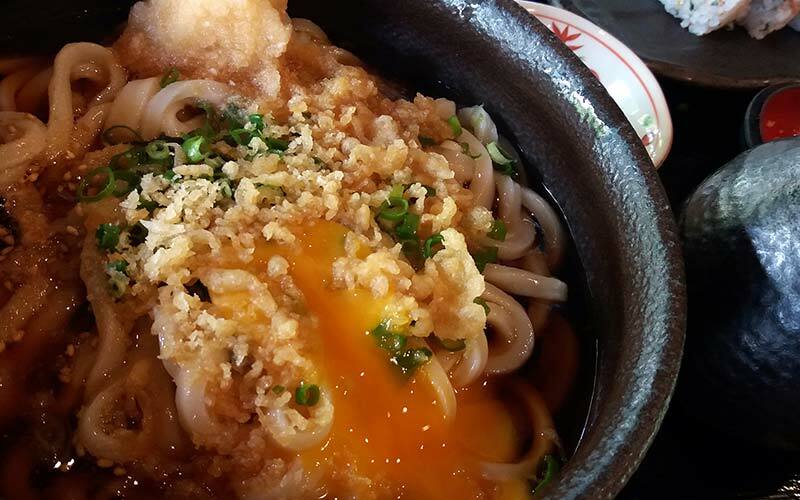 Kagawa prefecture is known for its Udon noodles. Popular all over Japan, “Sanuki-udon” from Kagawa are the most famous. It was named after “Sanuki”, the previous name of the prefecture. Udon are thick and white noodle, made from flour, and seasoned with light soy sauce. 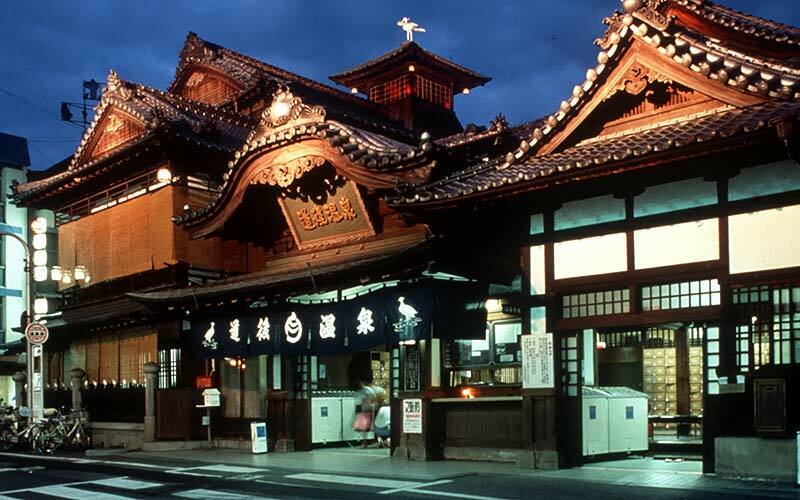 There are many restaurant to choose from but one favourite is Udon Honjin Yamadaya. This old building with beautiful gardens and views of the rocky outcrop Mt Goken serves some of Japan’s best. Follow scenic Route 183 over Shimada Island and along the coast for 1.5 hours or if you are in a hurry for udon use the Takamatsu Expressway and it takes about 1 hour. Between Sanuki and Takamatsu city small are mountains and peninsular of lava that jut into the Seto Sea. Begin the morning walking along the white sand beaches or take the cable way to the top of Mt Goken for views of the islands and across to Mt Yashima. It is a short drive to the top of this sacred place with Yashima Shrine dating back to the 8th century AD. The current shrine was built in 1330 AD and contains a 11 armed Buddhist figure called a Senju Kannon and uniquely Minoyama Daimyojin, a tanuki (raccoon dog) general who is said to change himself into different shapes in order to play tricks on people. Worshiped to bring good luck to family and night entertainment business. Leaving the coast you will drive through Takamatsu city which historically was the entrance way to Shikoku before the road links were built. 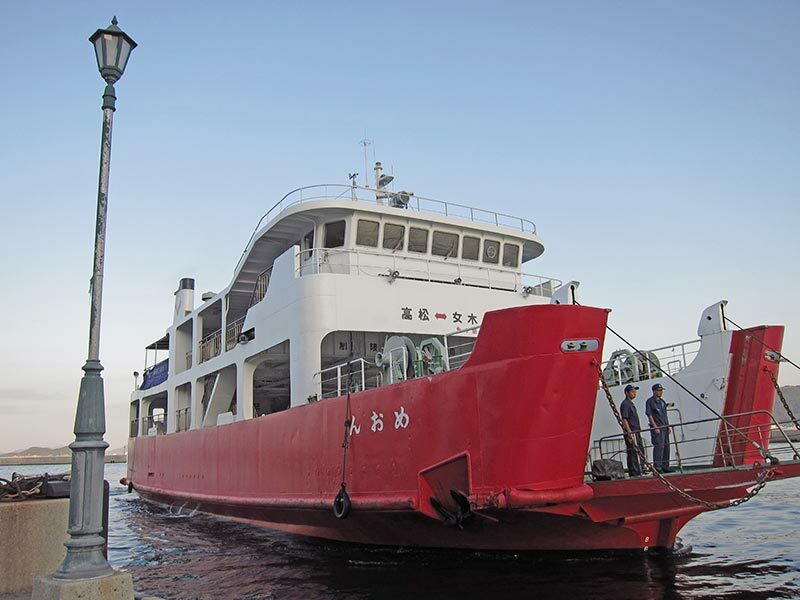 Ferry’s sail to and from the city to Japan’s main island and other ports and most train line start from here. There are ruins of old Takamatsu Castle and views of the ocean and Mt Yashima. 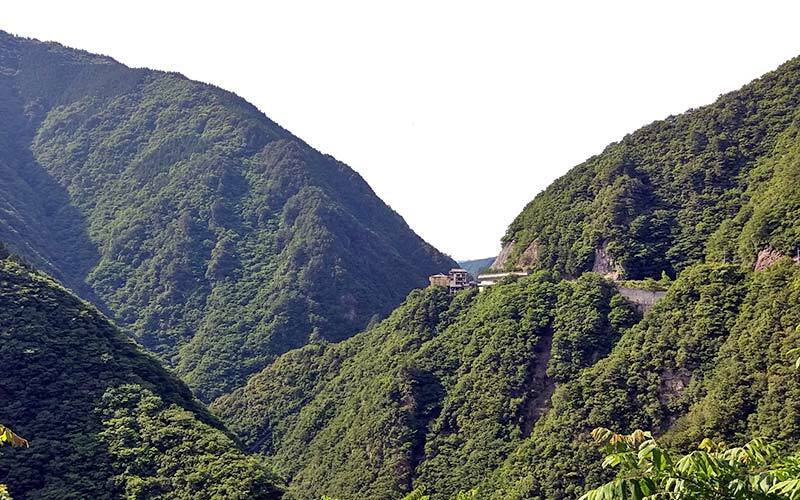 Get food and supplies before driving into the mountains of Shikoku, the roads here are scenic and depending on the route exhilarating. The quickest and safest is west along the Takamatsu Expressway and then south on the Kochi Expressway towards Otoyo interchange. It takes about 1 hour 20 minutes. 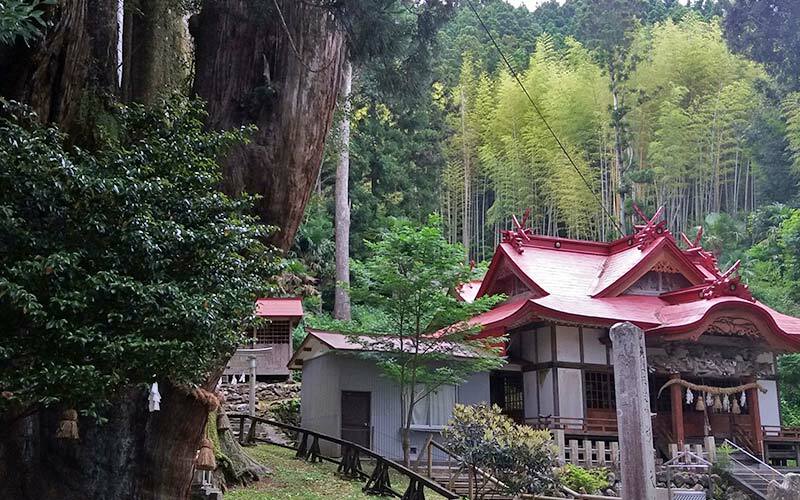 Otoyo township is in a steep river valley and has Japan’s oldest Sugi Tree (Japanese Cedar). Osugi comprise of two trees and are over 300 years old. The south tree is about 20 meters in circumference and about 60 meters in height. The north tree is slightly smaller. Standing under the cedars is Yasaka Shrine which is deeply quiet and gently listening you may hear the far beat of historical heart from the ancient times of 3000 years. was until recently very remote, surrounded by ancient thick rain forest and mountains make you feel a step back in time. 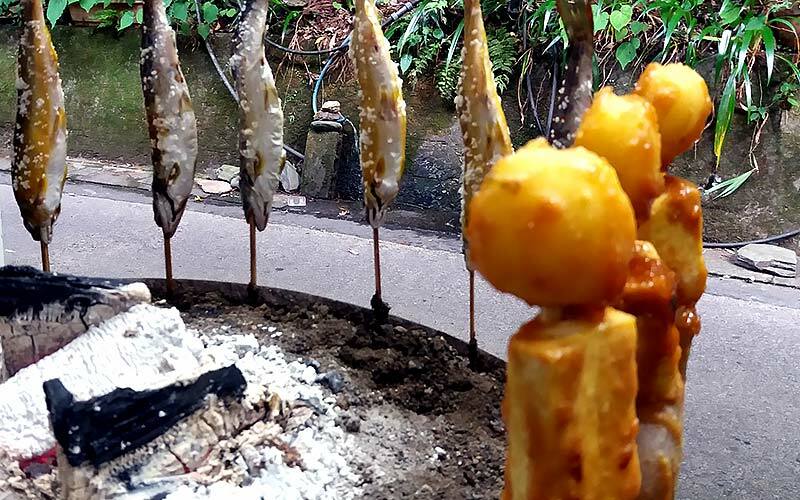 Cross the river on a vine bridge and snack on BBQ Ayu ( Freshwater Fish ) and savoury Dango ( Rice Flour Balls ) sold in small shop along the river. Return to Otoyo along Route 32. From Otoyo continue south out of the mountains for 1 hour either by local road or expressway towards Kochi city. Warning: Do not attempt to go Kazurabashi of Iya via Route 32 via Miyoshi city. This road is very narrow and not suitable for large vehicles. Severe weather and rockfalls will close this route. Use the Kochi Expressway instead. Kochi city faces the Pacific Ocean and Urado Bay and is the service and government centre for the southern coast of Shikoku. Kochi castle and famous market are open every day. 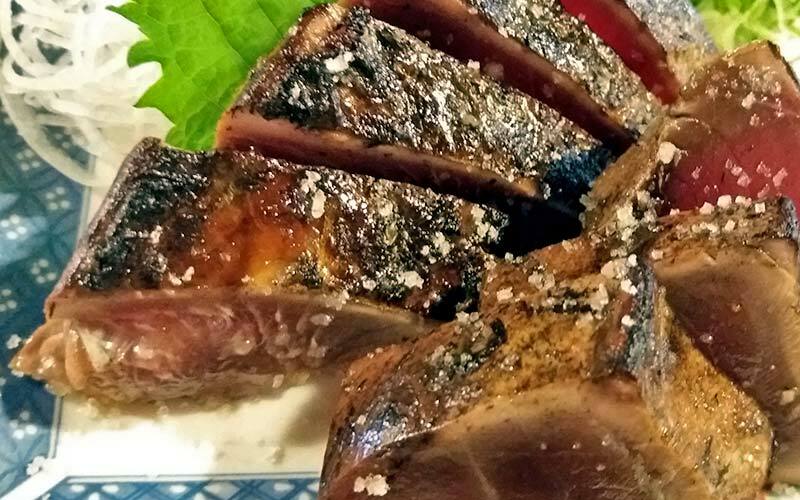 Make sure you try local dish Katsuo-tataki, flamed tuna sashimi. 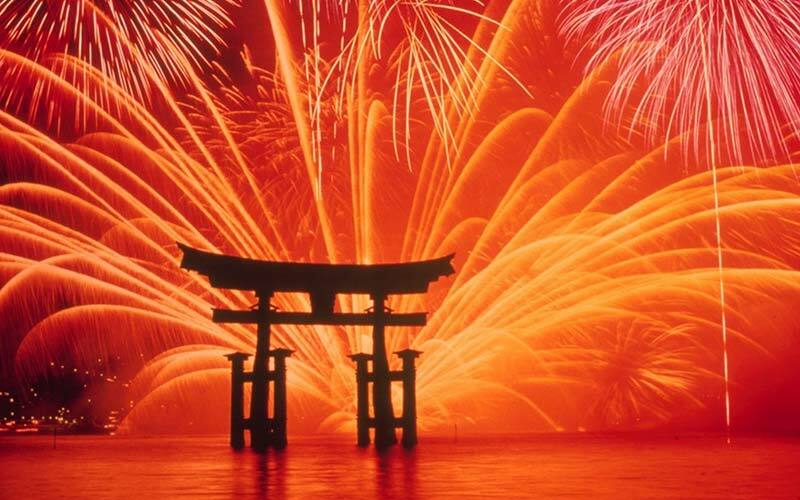 Not to be missed is Yosakoi-matsuri Festival when 20,000 dancers compete is held annually between 9 and 12 August. Camping options in Kochi city are limited to roadside rest area and bathing at hot spring bath house. After exploring Kochi start heading towards Shimanto. For a relaxing and scenic drive follow Route 23 along the coast through fishing village and natural harbour of Uranouchi Bay. 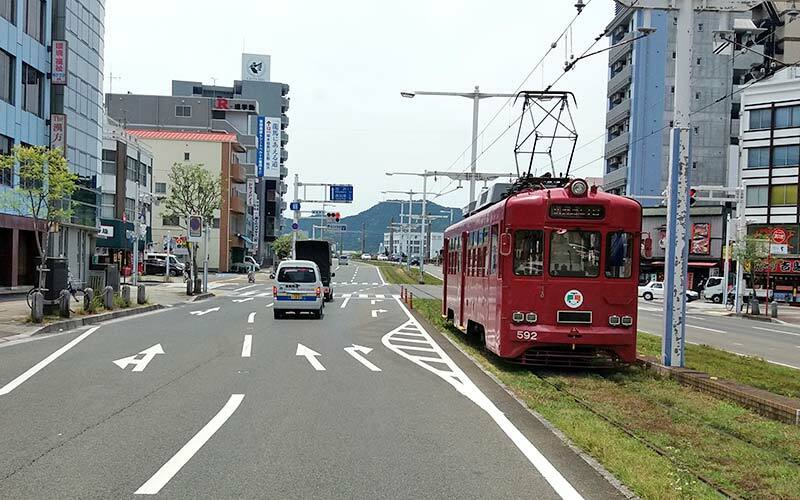 You will join back onto the Kochi Expressway at the port city of Susaki and then onto Route 56 which has great views of the Pacific Ocean and Cape Ashizuri to the west. It takes about 2.5 hours from Kochi to Shimanto area. Keep an eye out for Shinto Pilgrims walking along the local roads. 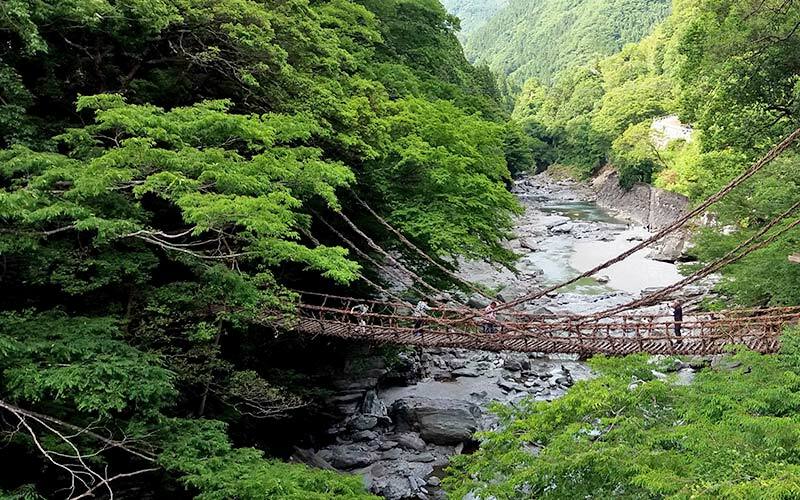 Shimanto River is one of the last untamed rivers in Japan and starting in the western mountains of Shikoku is bound by natural beauty. A bountiful source of freshwater fish such as Ayu, you may see local fishing using traditional techniques. 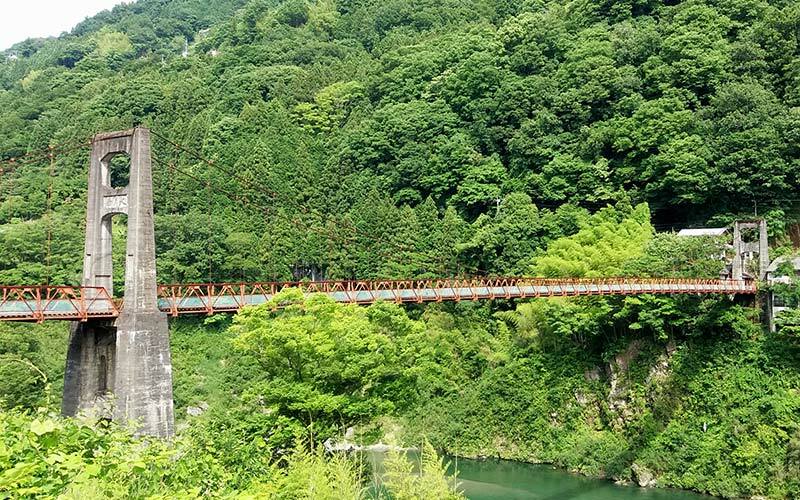 Follow the river upstream along Route 340 from Shimanto city to see its wild side. The small city of Shimanto on the lower reach of the river contains a rebuilt castle which origin date back to the 15th century. This is also a good place to get supplies before going further west. Continue to the remote south west headland of Cape Ashizuri . It takes about 1 hour from Shimanto on Route 321 which follows rugged rocky out crops into the ocean and past spectacular white sand of Oki Beach. 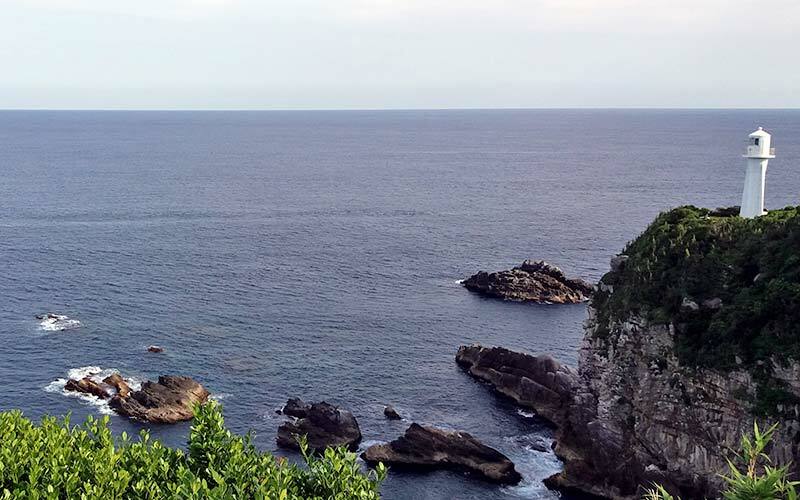 Cape Ashizuri juts into the ocean with 80 meter high cliffs and due to warm ocean currents there is an abundance of subtropical plants including Rhododendron forest. Go for a short walk around the lighthouse built in 1914 and gaze into the Pacific Ocean. Kongōfuku-ji Temple is one of the largest of the 88 temple pilgrimage and a place for weary travellers. 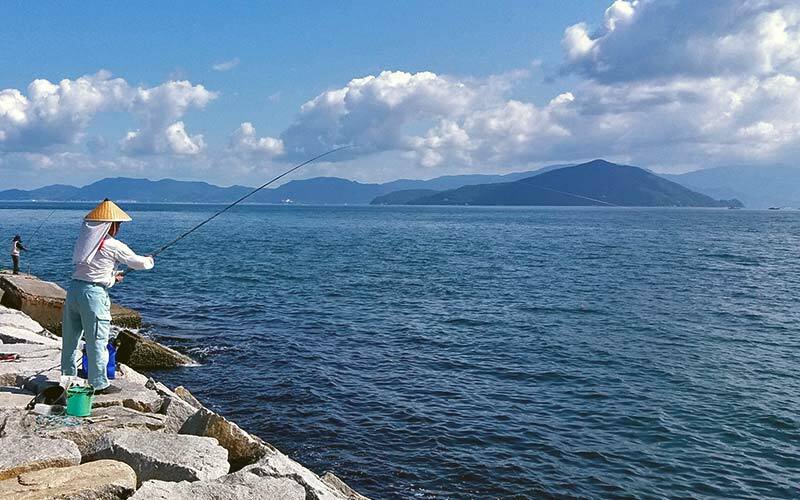 On leaving the cape you will pass through fishing habour town of Tosashimizu. The air is thick with the smell of Katsuobushi. There are factory smoking the tuna which is used in making Dashi (Fish Stock) and topping on Tako Yaki and Okinomiyaki, an important ingredient in almost all Japanese food. 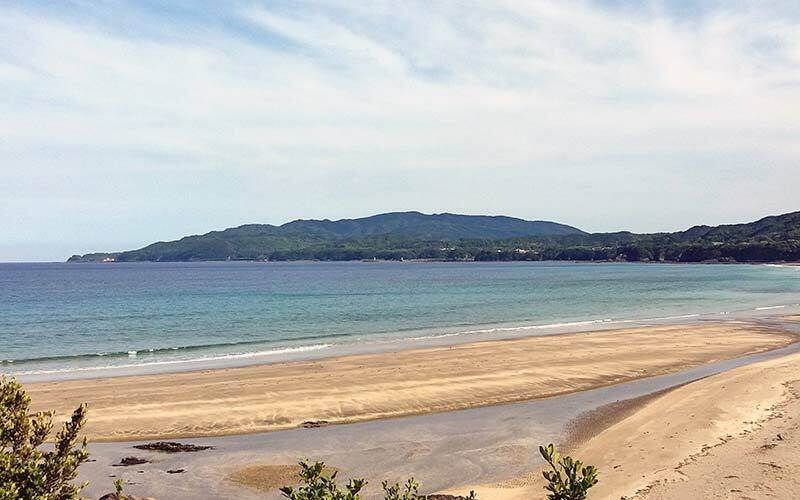 Follow Ashizuri Sun Road (Route 321) along the coast and stop at any one of the many cove beach with seaside villages for a walk on the sand. The sheltered bays with clear blue water are spectacular. After 1 hour continue through the town of Sukimo and the road becomes Route 56. Drive north for 1 hour into Ehime prefecture. Along the west coast of Shikoku there are many natural harbour and islands. The Uchiumi Sea is the name given this area. The beaches are not sandy but covered in round rocks. In the bay there are hundreds of fish enclosure and buoys used for farming fish. You can even take a glass bottom boat tour or go diving . Follow the Route 56 north towards Uwajima and further on to Matsuyama city. Travel time by Route 56 takes about 2.5 hours or by Matsuyama Expressway 2 hours. Both roads take a path through the mountain valleys but pass briefly through the port city of Uwajima. Uwajima is castle city named after the ruling lord of feudal Uwajima Clan in the early 17th century. It is famous for, “Bull Sumo Wrestling” that is held throughout the year in the arena on the side of the mountain that surround. The contest is between 2 bulls and there is no matador like Spanish bull fighting. 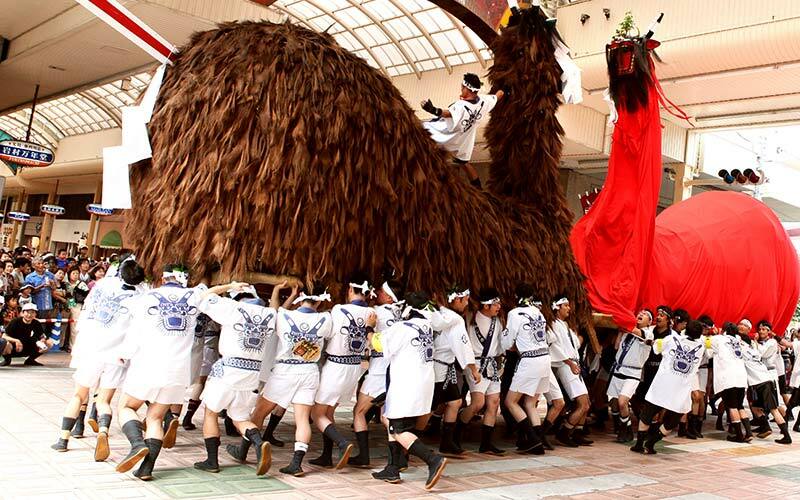 There is festival in July devoted to Ushi no Oni, a legendary beast with a monster face and bull body that fights evil. Ozu city is another castle town 1.5 hour north from Uwajima. Known as little Kyoto of Iyo you can see traditional samurai homes, warehouses and the castle. During summer you can eat a local hot pot made with sweet potato and local produce while watching traditional fishing methods on the river using cormorant birds. Spend the morning in Matsuyama city. The largest in Shikoku with an onsen with 3,000 year history. Dogo Onsen main building was built in 1894 and is the only in Japan with a special bath reserved for the imperial family. You can relax in the bath or enjoy tea while wearing a Yukata (cotton bathrobe). 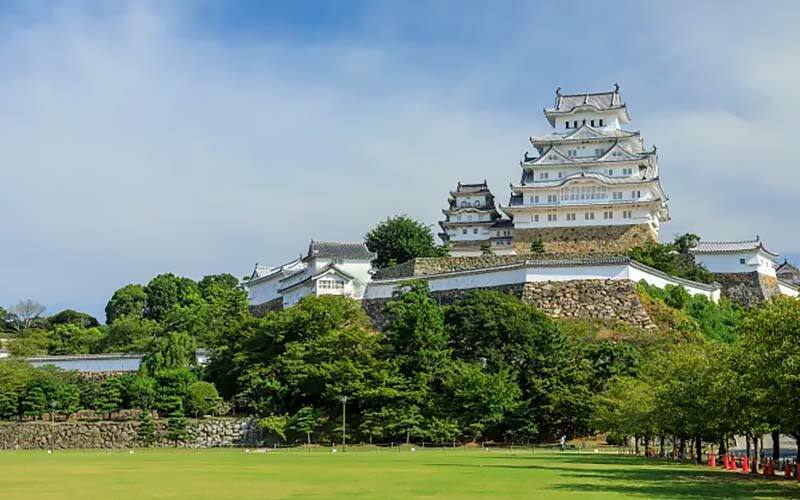 Other highlights of Matsuyama are it castle built on a hill in the centre of the city which is accessible by cable car, souvenir shopping along the many arcades and a ride on the street car. Follow coast Route 196 north for 1 hour 15 minutes to the departure point of Shikoku and Shimanami Kaido . This 60 kilometre long bridge and highway system crosses over 6 islands in the Seto Inland Sea and on to the main island of Japan, Honshu. There is a pedestrian and bike path system that follows the highway and allow for amazing views of the ocean and unique modern bridge designs. You can rent a bicycle and ride the full distance or just go across to the first island. 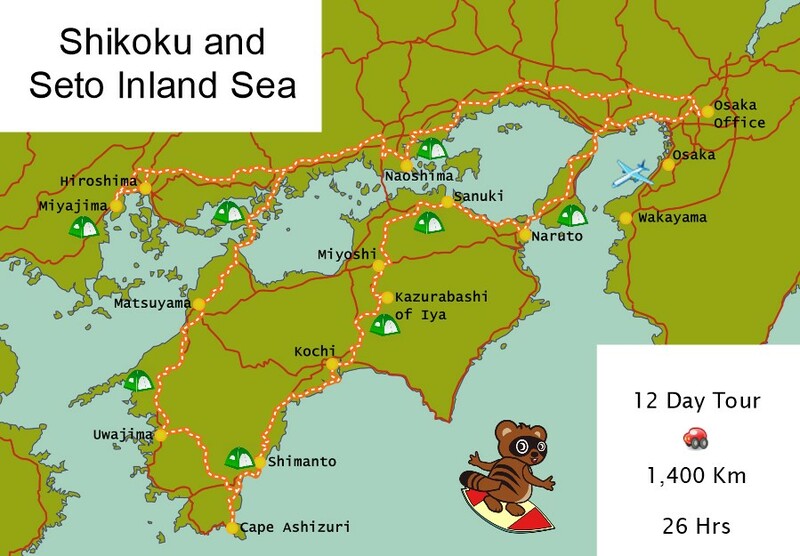 Complete the journey across the ocean and on towards Hiroshima city. It is about 2 hours via highway. 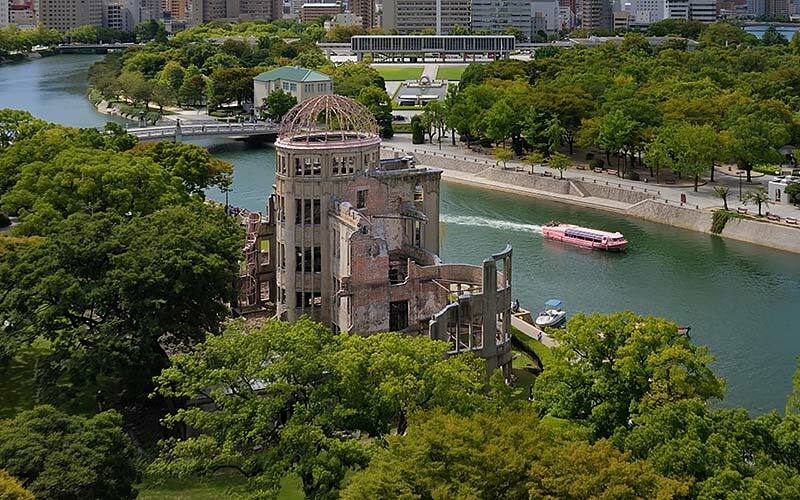 Hiroshima Peace Memorial Park is placed in Nakajima central area and a reminder to horror and destruction of war. The city was destroyed and countless lives lost in 1945 when an atom bomb was detonated here. You can see the remains of the Exhibition Hall and memorial gardens. 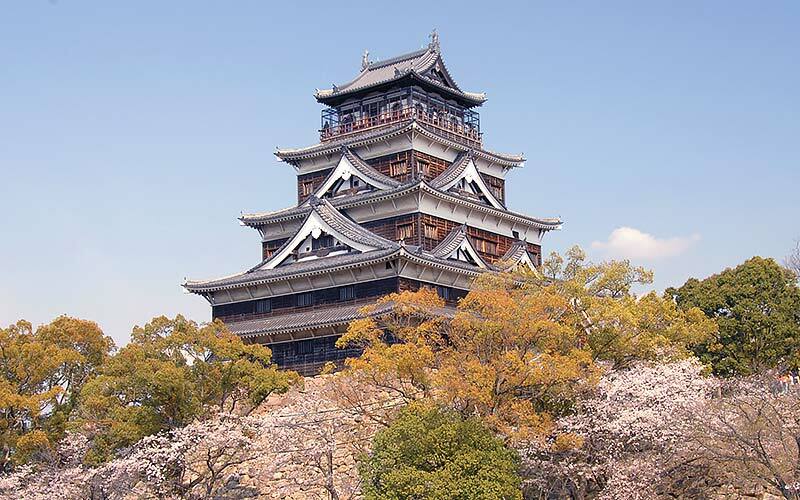 Also worth visiting is Hiroshima Castle which was originally built in 1589 but was rebuilt after the war. It has 5 tiers and surrounded by moats. Try a local favourite food, Hiroshima Okonomiyaki. A savoury pancake with noodles and seafood or pork. Warning: Parking is limited in central Hiroshima. Do not park illegally on the street as large parking fine apply. Miyajima Shrine Ferry is about a 30 minute drive from Hiroshima along Route 2. There are no roadside service area in the area. Bath and dine at nearby hot spring bath house. There is a parking area with toilets next to the onsen. Miyajima is also known as Itsuku-shima. It is only a short ferry ride across to the island. You must leave your vehicle at the terminal. The island has been a place of Shinto worship for thousands of years and the Itsuku-shima-jinja Shrine was built in 593 AD. Men of power have always worshiped and protected Miyajima. 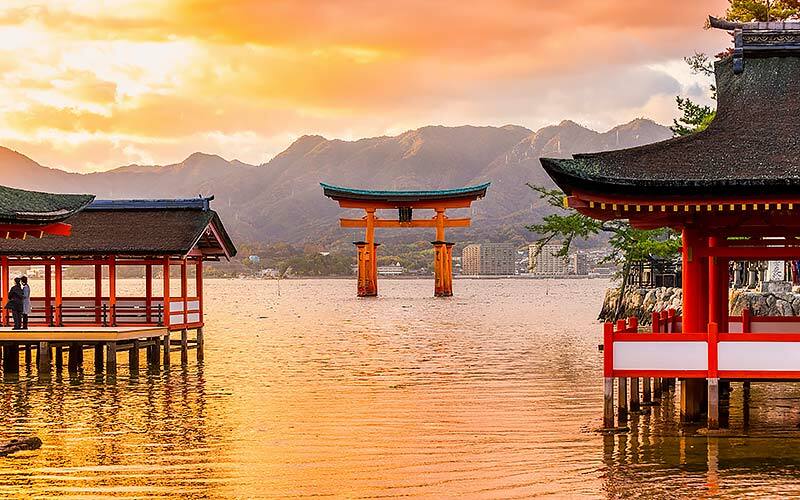 The shrine is famous for its huge red gate (tori) sitting in the water with views of the mountains and Hiroshima Bay. Mt. Mi-sen in the middle of the island can be climbed by hiking or ropeway. Enjoy watching over 13,000 fish at the aquarium or eating them. 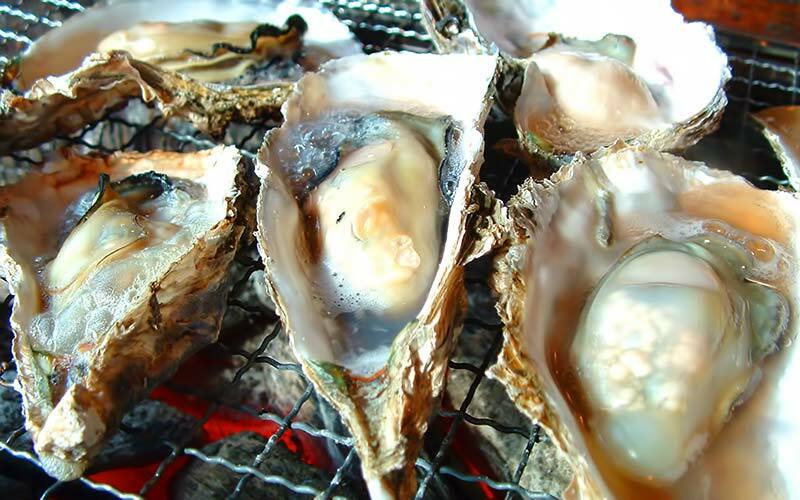 Fresh oyster and eels caught locally are a delicacy. The ferry ride across only takes only 13 minutes. After enjoying the morning on the island head back to your vehicle. Get onto the Sanyo Expressway and drive east towards Okayama city for 2 hour. Exit at Fukuyama and it’s just a few minutes to the coast. Head east for Naoshima Island . Drive on Route 2 and then south on Route 30 for 1 hour 30 minutes to Uno ferry terminal. You can either leave your vehicle at the port and use public transport or rent a bicycle on the island or for an extra fee bring your vehicle to Miyanoura Port and drive around the island. It’s only 20 minutes by ferry. 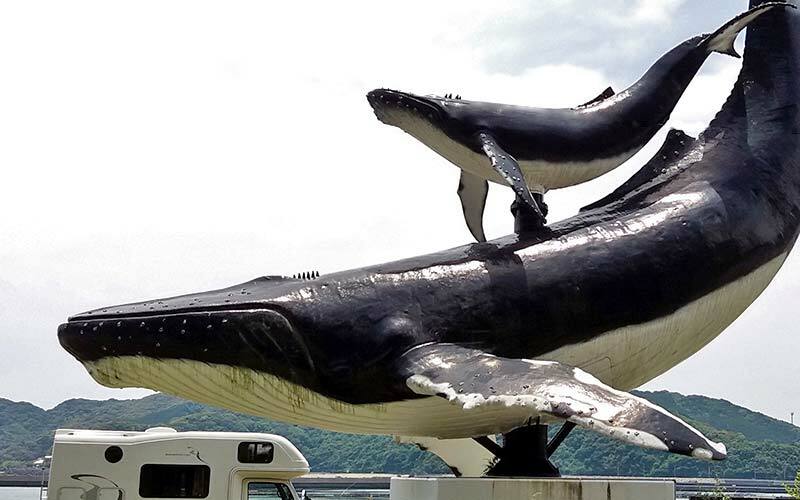 Naoshima has become a focal point for artist’s and lovers of art. Benesse Art Site Naoshima is an attempt to create new type of space and experience by setting contemporary art and architecture amidst the beauty of nature. Artist Tadao Ando designed the Chichu Art Museum, where “Water Lilies” by Claude Monet, and works by James Turrell and Walter De Maria, contemporary artists long involved with Naoshima island, are displayed in its permanent collections. After returning to your vehicle. Drive east on Route 45, then Route 2 and Route 250 for 1 hour 30 minutes to Ako city. 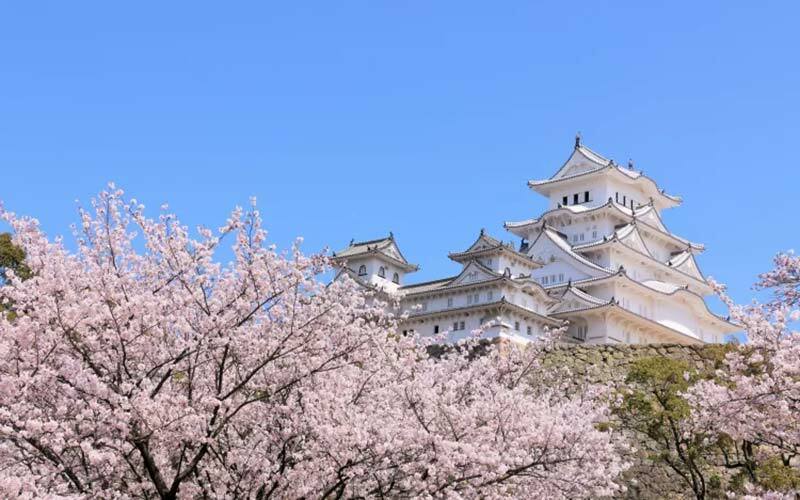 In Ako city near the campground there are the ruins of Ako castle but more inspiring is Himeji Castle. It was constructed in the mid-14th century and is unique in that it is plastered white. It is said to resemble a white heron and popular to view during cherry blossom season. Get there by driving east for 1 hour on the Sanyo Expressway. It’s time to go back to our office. On the way stop at the port city of Kobe, known for having some of the expensive beef in the world at 30,000 yen a steak. Reflect on an amazing trip and don’t forget to tell all your friends!